An unfortunately located scratch in your aquarium glass can greatly detract from the overall appearance of your underwater ecosystem, especially if it catches the light or crosses a favorite decoration. The depth of the scratch affects how well it can be fixed, so keep your expectations realistic. Also, if the scratch is on the inside of the glass, you can't blindly use any chemical or home remedy you read about; some may change the water chemistry or be harmful to fish, invertebrates, coral or plants in the aquarium. Buy a small container of cerium oxide polish. It's commonly used by jewelers to clean and improve the appearance of their merchandise, and it works well on shallow-to-moderate glass scratches. It's also safe for use on the inside of aquarium glass. You can find cerium oxide polish easily online. Siphon out enough tank water that you can get to the scratch, if it's on the interior, and relocate your fish to a secondary holding tank. Remove any decorations that obstruct your access to the scratch. Clean and dry the glass you'll be buffing and outline the scratch with a marking crayon or marker. Lay sheets of plastic wrap over the surface of the remaining tank water to prevent powder or dust from getting into it. Use masking tape to secure the plastic against the sides of the tank. Dry the glass with a clean cloth where the tape is going so it adheres well. Be thorough and form a complete protective layer over the water. Attach a hard rubber disk and soft buffing pad to an electric drill. These items are easy to find online or at a hardware store. Mix the cerium oxide with water in a spray bottle as directed by the package instructions. This creates a thin slurry you use to buff out the scratch in the aquarium glass. Spray the buffing pad with the cerium oxide slurry. Coat it well, but don't get it so wet the slurry will be flying off when the pad spins. Press the buffing pad flatly against the aquarium glass where it's scratched. Turn the drill to a low setting, press it against the glass—just don't use enough force to knock over the aquarium or break it—and slowly move the drill up and down and back and forth over the scratch. Check periodically that the aquarium glass isn't getting hot. If it is, mist it with a bit more polish or, if there's already a good amount of polish on the glass, with a little cool water. Continue buffing and inspecting your progress until the scratch is satisfactorily eliminated, which may take more than an hour. Rest as needed. Wipe away any residue from the cerium oxide slurry with a clean cloth. 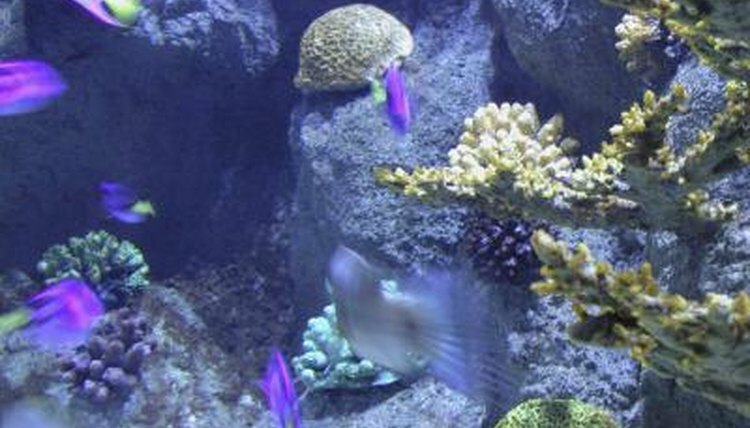 Return items to the aquarium, refill it with your standard treated water and put the fish back into their home. Wash the buffing pad as per the package care instructions.  In general, if you can't detect a scratch by running your fingernail over it, you can repair it well. Deeper scratches can be fixed with different grits, but it's hard and tedious work best left to a professional. ⚠ Be careful when using sponges, algae scrapers and other cleaning implements on your aquarium glass. Avoid abrasive cleaning surfaces whenever possible. ⚠ Polishing with a drill that's on too high a setting generates enough heat that you may crack the aquarium glass.